For those unfamiliar with epilepsy, you may picture a person dropping to the ground and shaking uncontrollably. Purple ribbons and 5Ks. Before I was a nurse, and really even far into my general career, that is the picture I always saw. That image can be terrifying alone, and that is just the tip of the iceberg. For those stricken with this disorder, and especially for caregivers of children with complex medical conditions, the iceberg underneath will sink ships time and time again. Wait for you to rebuild, just to sink them some more. It means sleepless nights, it means a monster that constantly tags along, an imaginary friend waiting to throw a lightning jolt through your child’s brain at the most unexpected moment. But there are treatments, and CBD Oil is one that might just work for your child. Epilepsy is a brain disorder that causes a person to have repeated seizures, or be at risk of having seizures, over a period of time. Epilepsy can come as a single diagnosis or be one part of a syndrome or injury. Affecting 50 million people worldwide, and 468,000 of those being children, it is the third most common neurological disorder in the United States following Alzheimer’s disease and stroke. There are approximately 40 different types and ways a person may seize, and even then, each child or person will seize differently. There are frontal, focal, partial, and tonic seizures. The list goes on and on. Epilepsy means hospitals and specialists, testing, and medication after failed medication. It means seizure plans and rescue meds, purple ribbons and 5Ks. It means auras and full moon schedules. It can mean isolation and depression. It means watching over your child while waiting and counting the seizures as they come, how long they last, and the minutes, hours, and days seizure free. It also means researching every possible way to help your child. Listening to highly qualified practitioners speak and trying to understand the words they use. Then once you do understand, wishing you didn’t have to. It means choosing between lists and lists of drugs and side effects all to reach ONE positive effect…seizure freedom. Should you give a diet of mainly only fat like the ketogenic diet? Do you put your child in the hands of a brain surgeon? All for one goal. And unfortunately for many, that goal is never reached. More medicine comes, more seizures come, more testing and hospitals and side effects come. You start to question whether or not you would rather see your child seize instead of be medicated so heavily, just so you can catch a glimpse of the child you once saw smile, talk, or eat. The child you once saw be able to lift her head on her own and now can only lay there. Then, you may come across something that seems crazy. You have a mother message you about an alternative treatment. My daughter was born with multiple congenital abnormalities. Hospital stays and surgeries were how we spent the first few weeks of life and months to follow. 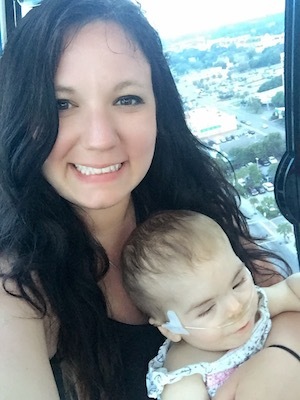 At two months of age my baby started having seizures. She seized most of the day but in a way that we didn’t even realize was seizures. Finally, she started turning blue while she froze and to the ER we went. She was immediately started on Keppra and was sedated so heavily that they started questioning the need for a feeding tube. What was CBD? How did she know that I was already brainstorming ways to move my family to Colorado? You all have heard the stories. Little girl moves from her home in Ohio to start taking medical marijuana in Colorado. Little girl is seizure free. This was also during election time when Issue 3 for legalization of marijuana in Ohio was on the ballot, so commercials about the topic were playing constantly. So I simply Googled CBD, while asking this mother for more details. Well, this mother shared the same story. A child born with epilepsy, a child that has failed to reach seizure freedom with multiple medications piled onto each other. A child in a wheelchair because she cannot use her muscles. A child who will be going to kindergarten soon, but still in a diaper. A child who cannot read or write or meet milestones like so many of our children. Then she began a different story, a child who stopped anti-seizure medications. A child who started getting CBD oil for her seizures. A child who weaned each medication successfully. A child actually seeing seizure freedom. A child who began to speak, walk, and no longer wear a diaper. A mother like all of us in some form or another, starting to tell a story that we all would like to share of our children. Because of a plant that has put our country into an uproar. CBD, or CBD oil, is short for cannabidiol, an element found in the Cannabis Sativa plant. It is one of the non-psychoactive ingredients in cannabis. It binds to a system in our body called the endocannabinoid system. This system is one of the newest discoveries in medicine, and is being shown to play a huge role in our health and wellbeing, including during pregnancy and while nursing. This system has until recently has been neglected. Keppra failed my baby within two weeks. We were given a titration schedule to increase the dose every couple of days. And every day we saw seizures. I had spent most waking moments during that month of medication failure and our new way of life studying and researching and talking to others about this plant. I finally ordered a tiny bottle of hemp CBD. It shipped out of South Carolina to my door, legally because it was a hemp supplement. The oil came with dosing and lab work showing the ingredients, and a company that was very supportive, knowledgeable, and a phone call or message away to walk me through the process. We gave my then three-month-old her first dose of hemp cannabis oil, and that night we did not see a seizure. The next day we did not see a seizure. This pattern went on and on and eventually we were seeing so few that the doctor repeated EEGs with clean results and began weaning Keppra. In 100 days since starting CBD oil, our baby had had five seizures total that were triggered with a couple of ear infections and a respiratory infection. Because of those other families who had fought for their children, because of other children coming to life, my daughter hasn’t had to have the same story of endless seizures. She has a disorder that is extremely rare, called Borjeson Forssman Lehman Syndrome, with only approximately 60 known cases in the world. 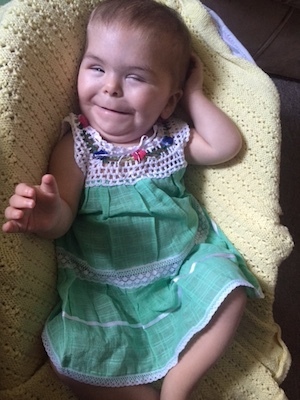 We don’t know much about her future because of how little is known of the syndrome. I am thankful to have an endless supply of support from groups and informational sites to turn to with questions, and specialists that are supportive and want to see her flourish as well as she can. But we do know her brain was built to have seizures, and our brains were built with cannabinoid receptors, which is why I believe CBD is so beneficial. As a nurse who at one time respected MOST if not all medical professionals with automatic trust that not all deserved, I want you to know that no matter what a professional tells you, he is not always right. As I still respect their OPINION, because that’s what it is, I weigh everything and make a final decision on what is best for my baby’s life. If you feel in your heart something is wrong, speak about it. If you do not want that dangerous drug they are offering, then say no. If you do not know, ask questions about alternative treatments. Ask the cannabis community if no medical professionals will help you. Cannabis oil is doing amazing things with my daughter and so many like her. It is giving seizure freedom. It is giving children their lives back.